“KDP Select is evil.” “Free promotions are pointless.” “Nick, you’re an idiot.” These are things I hear on a daily basis, the last usually being something I say to myself when I’m looking in the mirror. As for the first two, I talk with a lot of people who have strong opinions on the merits of making their books available exclusively at Amazon for 90 days, and the words “shackled” and “dungeon” come up a lot. It’s the same for free days—half the people think free days are a godsend; the other half would rather cut off their own limbs with a rusty spatula than offer their books gratis. And that’s cool; I don’t have anything against people having wildly different opinions—plenty who publish make decent incomes without touching free promotions, and plenty swear by them. But I like to look at the cold, hard numbers before coming to a conclusion, as everybody’s mileage seems to vary. Signing up to offer a variety of titles exclusively via KDP Select, with rotating free promotions on each book. This is pretty easy to do with the five free days you get to play with per the KDP Select contract. Not offering titles via KDP Select and offering them via other vendors, with the first book in a series permanently free. This is also pretty easy to do. There are pros and cons for both approaches. Here’s the skinny on my results. 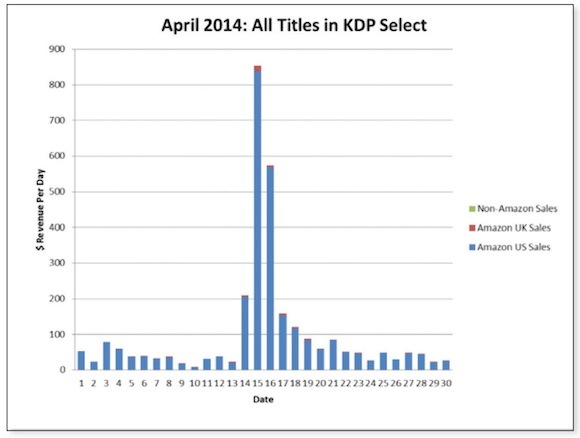 The graph above shows sales for April 2014. The large spike in the middle of the month reflects income generated from a Bookbub free promotion (30,000 free downloads). As you can see, the spike was pretty awesome. But sales dropped back down to normal pretty fast. This has happened most of the times I’ve run a free promotion. 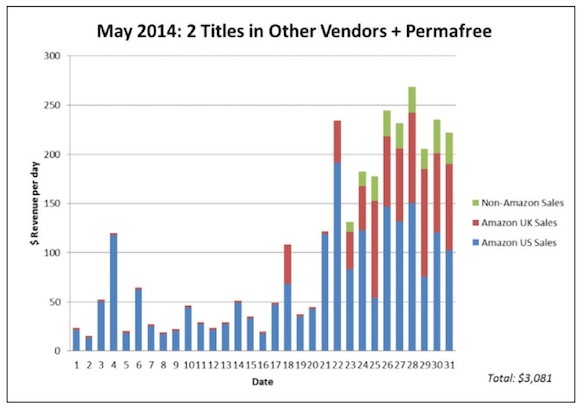 This graph shows sales for May 2014. You can see a dramatic difference here. To enable comparing apples with apples, I ran a free promotion with Bookbub in this month, too. Clearly, while immediate results were lower, the residual effects lasted much longer, and they carried over after the month was up. Overall, my total income from the promotion was about the same with KDP exclusivity and with vendors in addition to Amazon, but the sales increase was far more persistent with more vendors. And this is a good thing—I’d rather have a bunch of sales spread across a month than sales for just a couple of days. That helps with boosting visibility since Amazon’s algorithms largely discount anomalous spikes in favor of consistent performance, and it helps keep things going when I’m not actively promoting or advertising. More important tactic #2 opened markets for me in the UK, where I live, as well as via Nook and iTunes. And my non-Amazon-US sales channels grew to account for roughly 50% of revenue, which was cool, as I was less vulnerable to sales fluctuations in one market. After I was able to pull all my titles from KDP Select, upload them onto other vendors, and set my strongest-rated novel to permafree, I applied for a Bookbub free promotion, which went live on the 27th of June. The results have been better than I could have hoped. Sales remained consistently higher for more than a month, beating my previous average daily revenue of $80 by a factor of four. Best of all, sales on non-Amazon retailers made up a significant portion of that figure, and Amazon UK opened up. Here’s a look at the numbers. These figures are for seven titles—four novels (priced at $3.99, with one permafree), one novella ($2.99), and two bundles ($5.99). You can easily see the boost in sales on the 27th, coinciding with the permafree title hitting the top 5 in the Kindle store. What’s different this time is that sales didn’t tank afterward. In fact, they stayed high for the following month, albeit with the usual up-and-down expected in this line of business. Obviously a huge improvement over the previous month. I’ve been extremely impressed with my first experiences with other retailers. Nook was simple and fast (12 hours from submission to publication); iTunes has been easy to work with (despite taking nearly a week to approve a title); and Kobo, which featured my permafree book as one of its “first free in series” titles, was a dream. My advice? 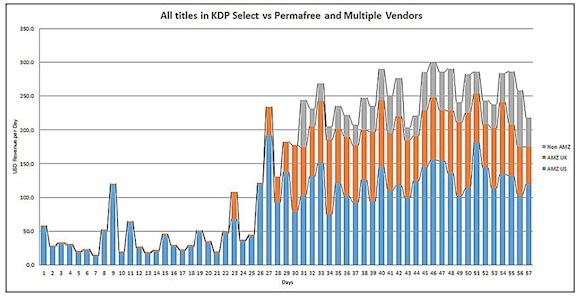 I’m still a fan of free, but I’ve found that having books out of KDP Select has positive effects. With KDP Select free days, I can drum up $1,500+ of extra cash in a 48-hour period, but that’s relying almost entirely on Bookbub, and sales go back down to normal almost immediately. Plus, there’s no guarantee that the ‘Bub is going to feature me every month. With books available through other vendors and a permafree title to keep readers coming in, I’m seeing much longer-lasting results—and I can use options that these vendors offer to keep the permafree’s performance “topped up” when it starts to drop, removing my reliance on Bookbub to a certain degree. Another ancillary benefit of permafree is e-mail signup. With a link to my New Releases newsletter in the front and back of my book, I’m getting a lot of clicks and a lot of opt-ins. An additional 70 to 80 per day added up pretty fast, leading toward the point where I could sell 50 to 100 books at full price because of e-mails I send once or twice per month, which also helps keep things going. Whatever strategy you decide to adopt, it’s definitely a slow build. Don’t be afraid to switch things around if something’s not working. Nothing happens overnight, and the long-term view is important.